I thought I would write a round up article of all the fragrance free/unscented products which I love to use. When I talk about fragrance free I’m referring to formulations which do not contain artificial fragrance or natural scents from essential oils. Why do I choose this type of product? For me, it lowers the risk of skin reactions and in 2015 I was diagnosed with sensitivity to linalool (which occurs naturally in some essential oils). My absolute favourite unscented cleanser has to be Handmade Naturals cleansing oil. It’s a delicious blend of Japanese Camellia, Rice Bran, Coconut oil and Monoi de Tahiti oil. I would also recommend Mallow & White Soothe Unfragranced Cleansing Oil, Siskyn Hot Cloth Cleansing Oil and Rossi Uvema Rice Bran & Borage Seed Face Cleansing Oil. If you prefer balms then look at Alucia or Harbour Elements. I’ve tried a number of fragrance free cleansing creams over the years but nothing has left a lasting impression. Regular readers know that I love Odylique Creamy Coconut because it’s free from linalool but it does contain limonene (from lemon oil). One ingredient oils such as Rosehip or Baobab are easily found but I have two hero products, Odylique Superfruit Concentrate and Skin & Tonic Naked Beauty Oil. It’s the blend of ingredients which I enjoy most and they both work beautifully on my skin. Alternatives to try are Lyonsleaf Unscented Marshmallow Soften & Rejuvenate Facial Oil, Silvan Skincare Skin Therapy Extra Gentle Face oil or Myroo Skin Boost Facial Serum (available Fragrance Free). If you prefer a traditional moisturiser then I like Trilogy Very Gentle Moisturising Cream. I’ve not found other fragrance free creams that I enjoy as much. I highly recommend Evolve Organic Beauty Daily Renew and Antipodes Rejoice, they are linalool free but technically not fragrance free as scented with vanilla. You all know exactly what I’m going to mention.....yes it’s my beloved Odylique Gentle Herb Shampoo. My favourite conditioner isn’t fragrance free but I can point you towards John Masters Organics Bare products and Green People has scent free shampoo & conditioner. I’m not sure if fragrance free styling products exist as I currently use scented products. I use plenty of plain shea body butters and they are widely available but I don't favour a particular brand over another. I think the nicest unscented body oil and cream I have used to date is the Ermana Soothe Mama Oil and John Masters Organic Bare Body Lotion. Both products perform well and keep my skin hydrated. I recently discovered Trilogy Pure Plant Body Oil. In the shower I like to use John Masters Organic Bare Body Wash but alternatives to try are Green People Scent Free, Desert Essence Fragrance Free or Odylique Aloe Vera body wash.
Do you have a favourite unscented skincare product? Have you tried any of the ones I've mentioned? 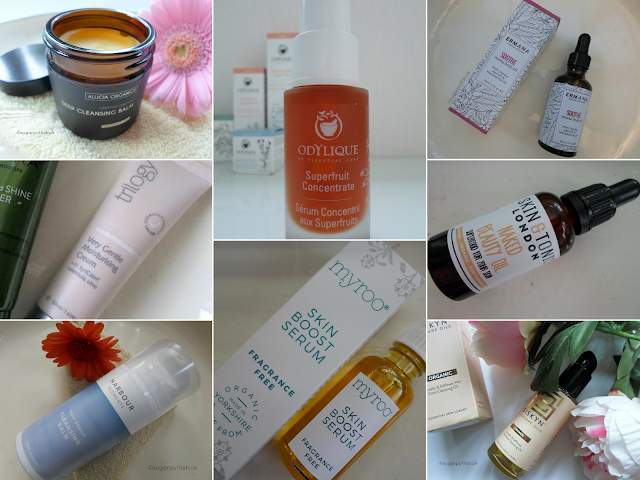 Perfect timing with this post, I'd been meaning to have a good search through your past blog posts to look for fragrance free options as although I don't have skin allergies my nose is very sensitive to smells (even more so than usual) at the moment. I'll definitely be looking into some of the ones you have mentioned, as although I have tried pretty much the whole Green People Scent Free line I haven't tried any of the others. Hair care has been the biggest challenge for me, I tried A'kin recently but it was too drying, the conditioner was OK though. Fragrance free hair stylers are probably the hardest one to find at least for me. So far I have only found two gels one from a brand called Jessicurl (Rockin' Ringlets is the only one with ingredients I thought were OK but I'm still learning) and the other one is from Alba Botanica who also do a leave in conditioner.